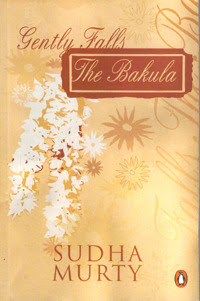 I was introduced to Sudha Murty’s writings by my daughter who had a lesson in her English textbook about a young girl teaching her grandmother how to read. That was a very touching story and it prompted me to buy her other books. “Gently falls the Bakula” was the first one that I read. The author has painted a very realistic landscape of a small town in Hubli with well drawn out characters. The protagonists are very identifiable with any townfolk in India, and that instantly connects the reader with spatial identification and empathy.